Where can the Diploma in Copywriting course take me? 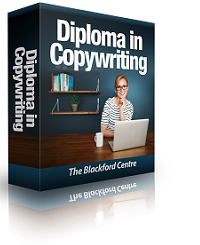 Your Diploma in Copywriting is the gateway to a career as a successful and high-earning copywriter. Having a qualification in copywriting makes the difference between being offered well-paid work or being rejected for every project you apply for. With your Diploma in Copywriting you can work as a self-employed copywriter from the comfort of your own home for clients all over the world. The internet means you're in constant contact with your clients and don't have to worry about travelling to the office each day. You can work at any time of the day or night and less time travelling is more time available to do the job you love! As a qualified copywriter you'll be able to build up a portfolio of clients who will trust you and return to you time and time again with more work. There's a big demand for qualified copywriters to write websites, newsletters, articles, press releases, leaflets and brochures and advertising material. Some copywriters decide to write on any subject, whilst others choose to specialise in areas such as travel writing, sales and marketing, finance, education, retail or fiction. Whatever you choose to write about, your Diploma in Copywriting will allow you to be your own boss and work as few or as many hours as you wish.